Whether it’s extreme summer or harsh winter, both can show up on your skin. Ya know, it can be in the form dried out skin, dark spots, redness, patches, dull and uneven skin tone. And if you are spending hours on a beach, you are likely to suffer skin discoloration. Other major skin concerns are blemish marks left behind by acne and pimples or sallow coloring after a night out. Finding the right products to reverse the above issues can be quite a task. There are tons of products on the market promising to do just that, but, as you know, it’s a saturated industry, and not everything works as well as it claims to. Which is why we set out on a mission to gather the top-selling products that are most effective to even and smoothen your skin complexion. 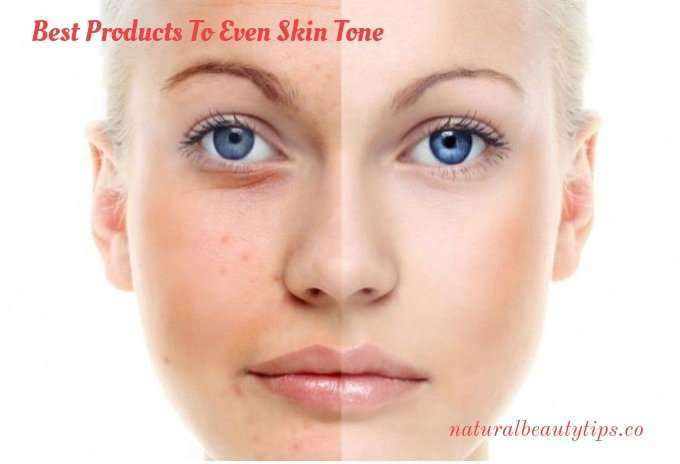 Keep reading for the top beauty products to correct your uneven skin tone. So your job becomes much easier. You just have to go through this list and pick the right one depending on your particular issue. An extremely concentrated, oil-free serum that improves the appearance of dark spots, promotes even skin tone, and boosts radiance. Fade them away with this highly rated, oil-free serum. (i) This cult product is highly concentrated with naturally powerful viniferine, an ingredient from the grape vine sap that is clinically proven to be 62 times more effective than vitamin C.
(ii) Extraordinarily treats stubborn blemish scars, age spots and other imperfections. (iii) Helps effectively treat dryness, dullness, illuminate skin and unify skin tone. (iv) The lightweight formula allows for immediate penetration and works well under makeup for flawless-looking skin. (v) Unveils brighter, more even skin and reduce the appearance of dark spots such as acne marks, scars, and sun spots with this satiny serum. (vi) Oil free, non-comedogenic and free of parabens, sulfates, synthetic fragrances, synthetic dyes, petro-chemicals and phthalates. Good Genes All-In-One Lactic Acid Treatment contains high potency, purified grade lactic acid that immediately exfoliates dull, pore-clogging dead skin cells, unveiling, smoother, fresher, younger looking skin. (i) This intensive treatment helps to instantly brighten skin while working to reduce the appearance of fine lines and restore damaged skin. (ii) Formulated with liquorice and lemongrass, the rich formula works to reduce the appearance of dark spots, hyperpigmentation and also helps to boost blood flow – bringing new life to tired skin and revealing a fresher, more even-toned face. (iii) Harnesses the exfoliating power of lactic acid that instantly brightens and restores the skin. (v) Apply as mask or use daily under makeup for an instant rejuvenating boost, reap long-term benefits and get skin truly glowing. (vi) Long term use revives skin damaged by excessive UV exposure, aging, acne scars, pollution, and lifestyle. Reduces acne scars, the depth and number of lines and wrinkles, even out skin tone, & increases epidermal firmness and thickness. (viii) Free of Parabens, Sulfates, Synthetics, GMOS and Phthalates. Best For: Normal, Oily, Combination and Dry skin. Formulated with Retinol SA, Glucose Complex, and Hyaluronic Acid, Rapid Wrinkle Repair Night Moisturizer moisturizes and renews the look of skin throughout the day. Helps to smooth wrinkles fast and diminish the look of age spots. Skin is left feeling smooth and looking younger. (i) One of the best on the market with intense moisture to smoothen lines, texture and wrinkles. The best part? It is economical, and boasts a one-week turnaround time. (ii) The vitamin C and accelerated Retinol SA work to quickly boost surface cell renewal, fading even the most stubborn dark spots. (iii) Helps to moisturize and rejuvenate. A brightening, exfoliating, and clarifying hydrator. This skin care essential provides soothing moisture as the highly effective ingredients break apart surface darkening and exfoliate it away, revealing luminous results. (i) This specially formulated moisturizer effectively treats past damages while also protecting your skin from future wear and tear by applying this moisturizer every day. (ii) Specially designed formula offers high-level UVA/UVB defense. (iii) Creates a more even toned and brightened skin. (iv) Exfoliates the damaged skin away to show off the gorgeous baby skin underneath. A creamy cleansing face scrub. This powerful scrub cleanses and exfoliates, removing dead skin cells to leave skin brighter, smoother and even-toned. (i) Uses micro beads to purify and emollients to soften the skin. (ii) This product is dermatologist tested. An all-in-one multifunctional Beauty Balm that supports anti aging while hiding uneven skin tone and blemishes. “Five-in-One” formula is designed to do it all: treats with high levels of active skin care ingredients; moisturize and smooth dehydrated skin; prime and perfect skin’s surface; camouflage and color correct the skin tone; and protect skin from the sun with SPF. (i) Botanical formula to purify and calm blemish prone or sensitive skin while also combating dark spots and pollutants for an enhanced radiance. Naturally covers blemishes and uneven skin tone and contains botanical actives to purify and calm blemish-prone or irritated skin. (ii) Contains Arbutin that works to erase unwanted dark spots, while caviar extract and antioxidants protect skin from inner and outer pollutants for an enhanced radiance. (iii) Lightweight with sunscreen that features SPF 25 for sun protection. One-step neutralizing coverage, this soothing cream provides optimal results for both women and men. (iv) Combats unwanted pimples while providing luminous glow on your complexion. (v) Free of Parabens, Sulfates, Phthalates. Best For: Normal, Combination and Sensitive Skin. An innovative, leave-on micro peel that transform your skin while you sleep for a dramatically softer, smoother, younger-looking complexion overnight. Treats dullness, fine lines, wrinkles, uneven tone and texture. (i) Formulated with the RetAsphere Smart Release™ Carrier System. (ii) This innovative, leave-on micro peel gently infuses skin with pure retinol to help diminish the appearance of fine lines and wrinkles, and speed up cell renewal. (iii) A groundbreaking combination of 10 percent glycolic acid and lactose helps resurface skin to a smooth, soft texture and reduces the look of pores. (iv) Natural Lactose helps skin renew at an optimal rate to help prevent dryness and flaking. (v) Fast-penetrating Hyaluronic Acid provides a surge of moisture to visibly plump and smooth the skin’s surface. (vi) Licorice Extract and Arbutin help to brighten skin and help diminish the appearance of discoloration. A soothing face mask that instantly reduces redness, irritation, itchiness and inflammation. Created for reactive, sensitive, irritated skin or normal skin exposed to stressful conditions such as sunburn, windburn, jet lag. (i) Effective in treating redness, uneven skin tone and rosacea. (ii) This 10-minute rescue mask is ideal for skin that is red, blotchy, irritated, sunburned, wind-chapped, dry, stressed, or jet-lagged. (iii) Leaves your skin with feelings of velvety soft and smooth with even tone and a luminous, healthy complexion. (iv) Free of Parabens, Sulfates, Phthalates, Synthetic Fragrance, Pore-Blocking petrochemicals, Silicones and Synthetic colors. An oil-free anti-aging moisturizer, rich in antioxidants, to weightlessly hydrate, even tone, and smooth skin texture for a healthy-looking complexion. Helps fading skin discoloration, dark spots, hyperpigmentation, age spots, sun damage and also evens out skin. Treats Dryness, Dark spots, Dullness, Uneven texture and Uneven Skin Tone. (i) Sheer Transformation Perfecting Moisturizer provides weightless hydration and luminous perfection. (ii) Formulated with a rich blend of botanical extracts, vitamins and smoothing fruit acids, it delivers radiance and improves the appearance of dark spots and discoloration. (iii) It is formulated with multi-fruit acids, plus licorice and pea extracts to help gently refine uneven skin tone and texture. (iv) It’s for all ages and stimulates collagen production while smoothing fine lines and wrinkles. (v) This silky, multitasking moisturizer is also the perfect prep step for makeup because it smoothens and brightens for flawless foundation application. The SkinCeuticals Phyto+ is an advanced botanically-derived corrective formula with soothing, restorative properties, working to dramatically improve the appearance of discoloration without causing irritation. (ii) Active ingredients are delivered in a hyaluronic acid base to provide intensive hydration as they help heal, calm, and improve the appearance of the skin. (iii) Contains extracts of naturally sourced Arbutin and Kojic Acid, natural alternatives to the chemical, Hydroquinone. They work synergistically to lift away the look of dark spots and hyperpigmentation for a more even and unified tone and are less likely to cause irritation. (iv) Extracts of Cucumber and Thyme have anti-inflammatory and antiseptic properties, which soothe red, irritated skin and promote feelings of calm – leaving the complexion feeling revitalized and fresh. A fast-absorbing liquid retinol serum supercharged by ferulic acid to retexture skin and visibly reduce fine lines for an instantly smoother, more even, lit-from-within glow. Treats uneven skin tone, uneven texture, dullness and fades fine lines and wrinkles. (i) This professional strength solution is formulated with naturally derived actives that combat all types of uneven skin tone and dull skin. (ii) Contains Ferulic Acid and Retinol. They are proven to decrease the hyperactive production of pigment, repair signs of aging and heal sun damage. (iii) Formulated with multiple actives, the treatment also helps to reduce and fade dark spots resulting from photo-aging, hyperpigmentation, hormonal changes and blemish scars. (iv) Contains Salicylic Acid and Willow Bark to minimize appearance of pores. (v) Created by a practicing dermatologist, the unique fluid-like delivery system absorbs quickly to treat all skin types. (vi) Free of Parabens, Sulfates and Phthalates. Best For: Normal, Oily, Combination, Dry and Sensitive Skin. A gel-like cleansing oil with a lightweight texture designed to soften and hydrate for a purified, radiant complexion. Treats dryness, dullness, uneven texture and uneven skin tone. (i) This naturally light gel cleansing oil is highly effective at removing heavy make-up residue while leaving the skin feeling soft and conditioned. (ii) Packed with natural olive and macadamia nut oils, the silky-smooth formula benefits, rather than strips, the skin’s natural oils for a luminous glow. (iii) This luxurious gel-textured, oil-based cleanser is brimming with skin-softening emollients designed to protect the skin and lock in moisture as it lifts away heavy layers of makeup. (iv) Enriched with skin-loving herbs that work to calm and refresh skin for a clearer, healthier-looking, more radiant complexion. (v) Free of Parabens, Sulfates and Phthalates. Best For: Normal, Oily, Combination and Sensitive skin. The Ole Henriksen Sheer Transformation Age Defence sounds great!